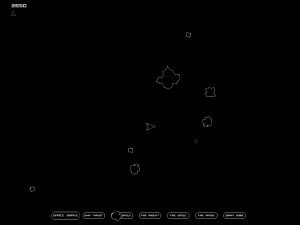 This is a free online Asteroids game (clone) with a twist, imagine Asteroids meets Nemesis for a good night out, here’s the result. Your starter ship is rather, well pants actually, so collect the power-ups to get the upgrades you so desperately need to win. Should you improve your ship’s speed or rotation first, upgrade the gun or go straight for the mega-super-(actually-rather-overpowered)-smart-bomb? Only you can decide. 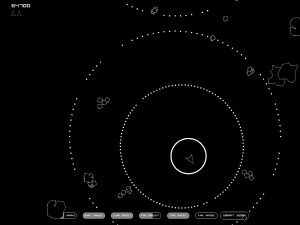 This Asteroids game is designed to get you moving a little more than the Atari original so don’t expect to just sit in the middle spinning around shooting like a maniac. Get thrusting and learn how to control the ship, it’ll help with some of my upcoming games too. You can find enough more or less accurate clones with a quick google and I wanted to add a twist to get you to want “just one more go”. 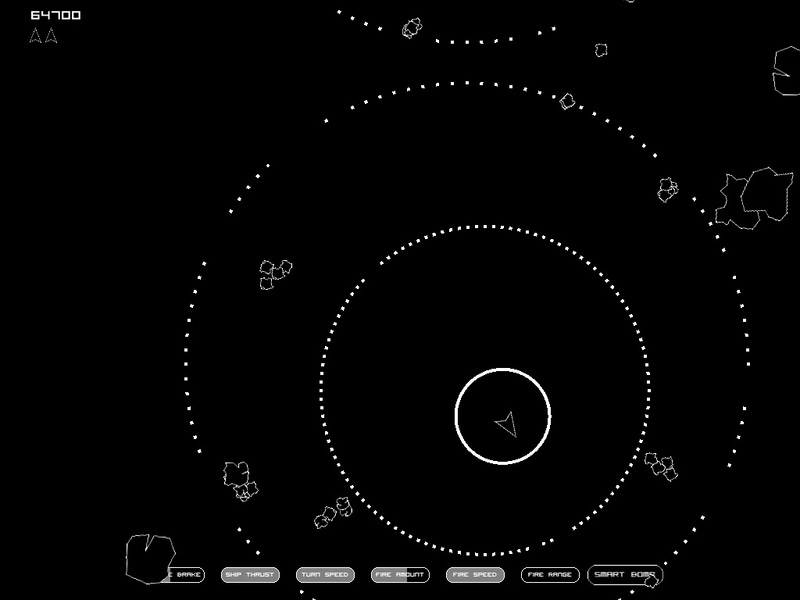 Asteroids Game showing smart bomb being activated. 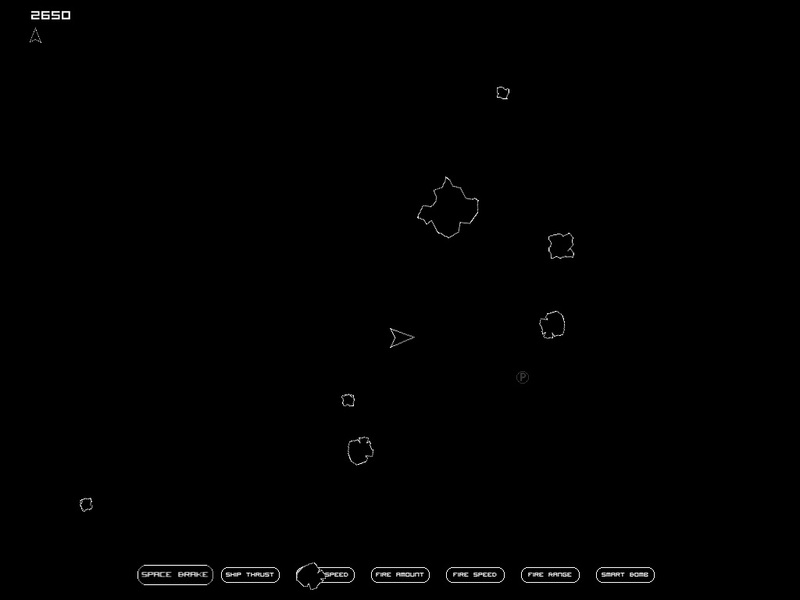 The original Asteroids game was developed by Atari way back in the seventies. For those of you old enough to remember it, hopefully you’ll also enjoy this version. -Smartbomb power-up icon stayed highlighted after activation. -Debugging “cheats” left in the game – well done if you found them. -Bullets weren’t coming from nose of the ship, evident when moving quickly. -Smartbomb significantly nerfed for balance reasons. -Power-up spawning changed by around 1/3 for balance. -Changed thrust and turn values to balance the upgrade system. -Google Analytics to see how long the average game lasts etc. -Uploaded first version to website. Next post Missile Command Online Game – Come Play! Bullet Speed increases both range and speed and I don’t see a reason to change that. However that does make Bullet Range largely redundant and when Range and Speed are both at 5 I think it’s way overpowered. The question is what power-up would you like to see replace Bullet Range and which position should it go in the power-up hierarchy (currently 6). Power-Up Pathway – What’s your favourite? I like alternating Thrust and Turn until they’re at 3 or 4 each before moving onto Bullet Amount and Speed, again alternating until they’re both about 3. At that stage I tend to upgrade all four to 5. Space Brake isn’t for me and since I’m replacing Range soon (didn’t I mention that already?) I tend to ignore that one. Smart Bomb? Oh yes but only when everything else is full, SB may need a bit of a nerf in upcoming releases for balance, let me know your thoughts.